Don't settle for blurry photos and videos shot with a smartphone. Capture important moments with the outstanding image quality of a Nikon camera, then instantly post them on Google+™, Facebook, Instagram or YouTube™, email them to friends, upload them to your blog and more—right from the camera! Introducing the COOLPIX S810c, a 16-megapixel, telephoto zoom camera that is also an Android™ smart device with a touchscreen, built-in Wi-Fi® and GPS. Shoot tack-sharp photos and Full HD 1080p videos—even in low light. Zoom in with the superb 12x optical zoom NIKKOR glass lens, then get even closer with 24x Dynamic Fine Zoom. Download apps and games from Google Play™, check your email or browse the web. And even when you're out of range of a Wi-Fi® network, you can wirelessly transfer your shots to a compatible smartphone or tablet for instant sharing. Instantly share the wonderful moments of your life in the brilliant quality they deserve. In addition to creating beautiful photos and videos, the COOLPIX S810c lets you do many things you'd do with an Android smart device: check your email, update Google+, Facebook, YouTube or any other social networking site, browse the web, stream music—the possibilities are endless. Plus, you get access to all the Android apps on Google Play, including thousands of exciting photography and video apps. Create truly exceptional photos and Full HD videos with the COOLPIX S810c. Its high-performance 12x optical zoom NIKKOR glass lens with 24x Dynamic Fine Zoom, an enhanced digital zoom function that effectively doubles your reach, and Lens-Shift VR image stabilization is paired with a 16.0-megapixel CMOS low-light image sensor for superior image quality, versatility and low-light performance. Your shots will impress even you. Photos and Full HD videos look amazing on the COOLPIX S810c's large 3.7-inch touchscreen display. 1.2-million dots of resolution render all the fine details captured by the camera's advanced CMOS image sensor in lifelike brilliance. The extra large screen also makes it easy and comfortable to use apps, watch videos and browse the web. Every COOLPIX is designed around a genuine NIKKOR glass lens, the legendary optics that have helped make Nikon famous. The COOLPIX S810c features a 12x optical zoom NIKKOR glass lens with 24x Dynamic Fine Zoom—an enhanced digital zoom function that effectively doubles your reach—that takes you from wide-angle group shots to telephoto close-ups in an instant. And don't worry about a little camera shake—Lens-Shift VR image stabilization helps to keep your photos and videos steady, even when your hands are not. Record phenomenal Full HD 1080p videos with stereo sound. Connect to an HDTV and watch your videos come alive. When the action speeds up, simply hold the shutter button and fire off at rate of up to 8 shots per second to capture 3 shots continuously. Catch views you've never seen. Built-in GPS allows you to record the location of each shot you take, so you can follow the path of your adventure and every stunning view along the way. Easily add comments to your shots using the camera's touchscreen or through voice input, then post them directly to Google+ and Twitter. Browse your images in the new Timeline View, which displays your images chronologically. Connect stereo headphones or ear buds to the COOLPIX S810c and enjoy streaming music, the latest YouTube videos or the sights and sounds of the videos you recorded. 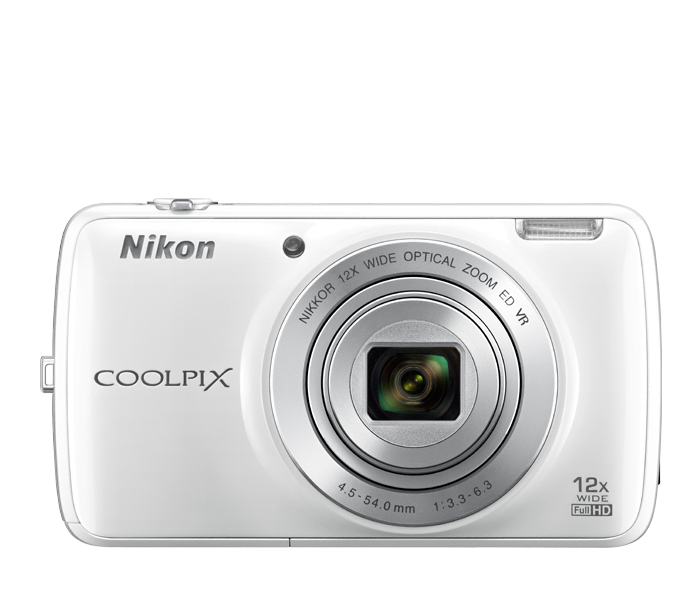 With the COOLPIX S810c you can download apps from the Google Play™ store including the NIKON IMAGE SPACE app, Nikon's free cloud-based image storage and sharing site. Access your photos anytime, anywhere; easily share them to social network sites and more.